Successfully Added Onda Obook 20 Tablet PC - Windows 10 + Android 5.1 OS, Intel Atom Quad Core CPU, 4GB RAM, 10.1 Inch HD Display, 6000mAh Battery to your Shopping Cart. The Onda Obook 20 is a slim and attractive looking 10.1 inch tablet PC. With mico HDMI, micro USB, 3.5 mm headphone jack and Micro SD card slot this tablet PC is a very versatile unit that offers plenty of options for peripherals, connecting to a larger screen and adding additional storage. A magnetic keyboard connection on the bottom allows you to turn this tablet PC into a mini laptop and is an exceptional accessory for those wanting to make the most of this tablets functionality. Clocked at 1.44GHz and with a 1.84GHz bust mode the Intel Atom Z8300 Quad Core CPU and a massive 4GB of RAM bring an exceptionally quick performance. Having a 10.1 inch screen makes this tablet superb for surfing the web as well as running games and playing movies. Thanks to the Intel 8Gen GPU and a 1280x800 display resolution you will enjoy it all on the Onda Obook 20 Tablet PC. 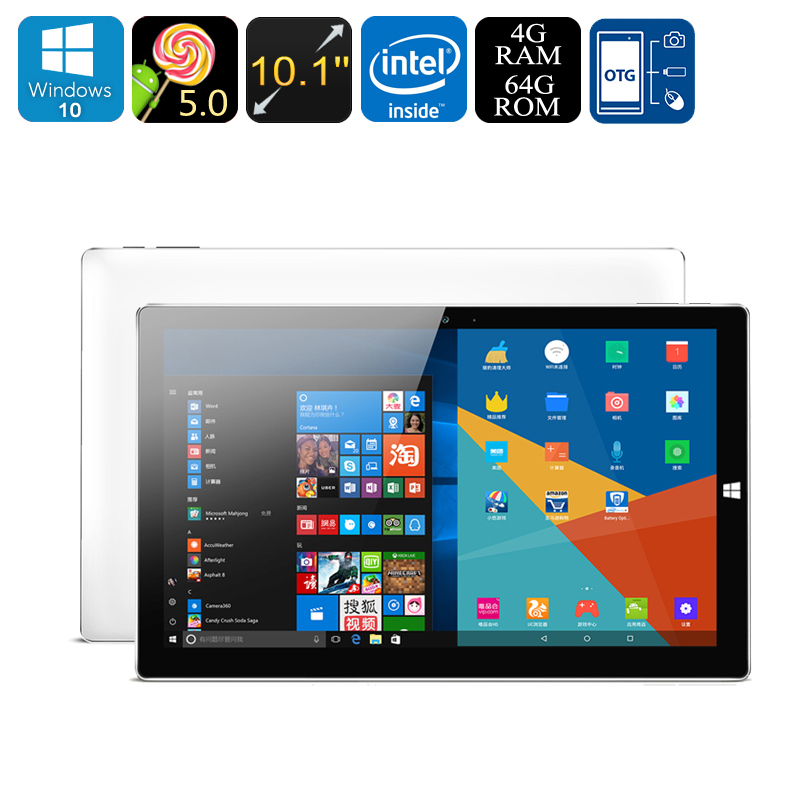 If you can't decide between and Windows tablet or an Android tablet then this is the choice for you. With both operating systems (Licensed Windows 10 Home Version & Android 5.1) you can take the best productivity and work software from the Windows OS and still enjoy all the Android apps on one device. A 6000mAh battery offers some nice usage and the built in mic and front facing camera let you enjoy group chats and video calls. Perfect for your portable office this light-weight tablet with laptop options is compact and portable so it's ideal for your mobile office or for college students. The Onda Obook 20 Tablet PC comes with 12 months warranty, brought to you by the leader in electronic devices as well as wholesale tablet PCs and Laptops..